Update at 10 p.m. — Arlington Public Schools will be closed Tuesday. 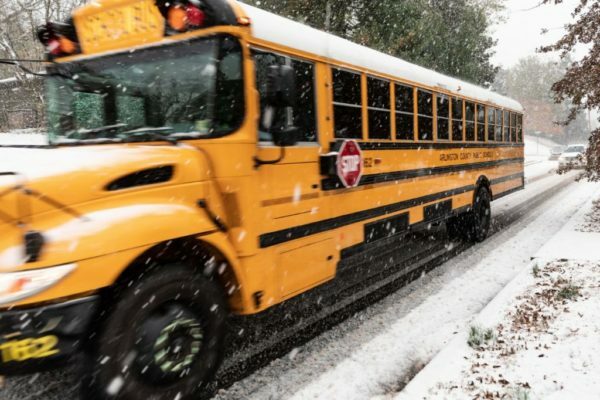 “Because we anticipate hazardous driving and walking conditions on some neighborhood sidewalks and bus stops throughout the County due to freezing tonight, all APS Schools will be closed,” the school system said. School offices will open at 10 a.m.
Arlington County government is currently planning to open on time. The federal government is opening on a two hour delay. Earlier: Arlington Public Schools will likely open on a two-hour delay tomorrow (Tuesday), as forecasters warn of a re-freeze of melting snow on county roads. The school system announced that it will open schools and offices two hours late “based on the current forecast and conditions for tomorrow morning,” but officials plan to release a final update at 6 a.m. Tuesday morning. That means any “essential personnel” and food service workers should still report to work on time. However, APS says it will watch for “deteriorating weather and road conditions” overnight and early tomorrow. County workers are already warning of below-freezing temperatures making roads a bit icy overnight, and forecasters fully expect that to cause more problems tomorrow. County offices, courts, and facilities are set to open as normal tomorrow, however. Arlington officials also plan to shift trash collection dates back by one day for the rest of the week, as snow removal continues.